There is only one way to terminate your account in Ubivox. You have to log in to the system and do the termination directly in your account. Due to security measures our support team cannot terminate an account. Remember to download PDF files of your newsletters and export files of the subscribers. If you have any questions, please write an e-mail to support@ubivox.com. This guide explains how you remove a recipient from a list. This guide elaborates how you can remove the Ask Toolbar and thereby see the menu in the bottom of the system again. 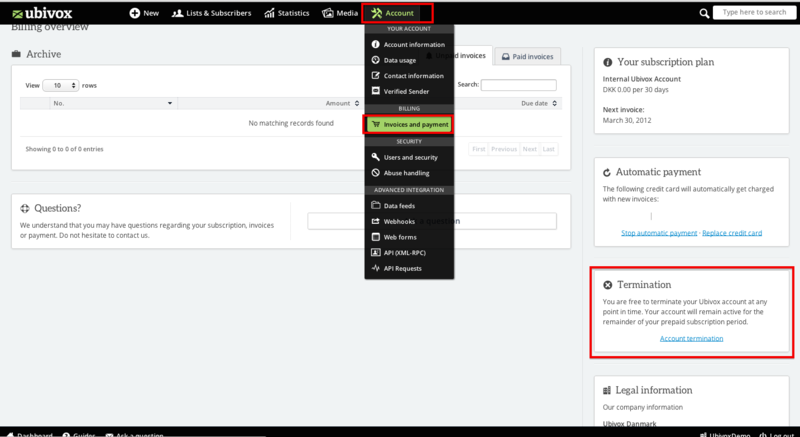 The subscriber control panel in Ubivox, gives you access to include a link in the newsletter, that the subscriber can click on to update their contact information in Ubivox. This guide exemplifies the process and elaborates why additional subscriber information can be relevant.